Joseph was excited about the weekend. He was IM’ing me every second of the last hour of the work day with ideas about our evening plans, and he finally, decisively declared that he wanted “burgers, Manhattans, and video games”. I suggested the usual: Stout, Umami, or The Bowery for the first two, we’d take care of the third at home later. He checked Scout Mob to see if there were any deals, and he found a “$30 for $50 Worth of Food and Drink” deal for FukuburgerLA on Cahuenga, as well as a happy hour event at Space 1520. Our plans took shape then and there. We made one of of our typical strolls into Hollywood, walking past Franklin Village to see what was going on at UCB and to check up on the Scientology Celebrity Center – make sure those religious celebs weren’t getting too rowdy – and then we turned onto Hollywood Blvd at Bronson, near what would normally be the always-lively crowds at the Music Box (sadly, it closed its doors this week, and last night it sat silent). As we passed the W Hotel, we stopped to watch an a capella trio whoop it up in front of the Pantages. I desperately wish I’d gotten video of them, but they were so good that I got caught up in the moment, and forgot. 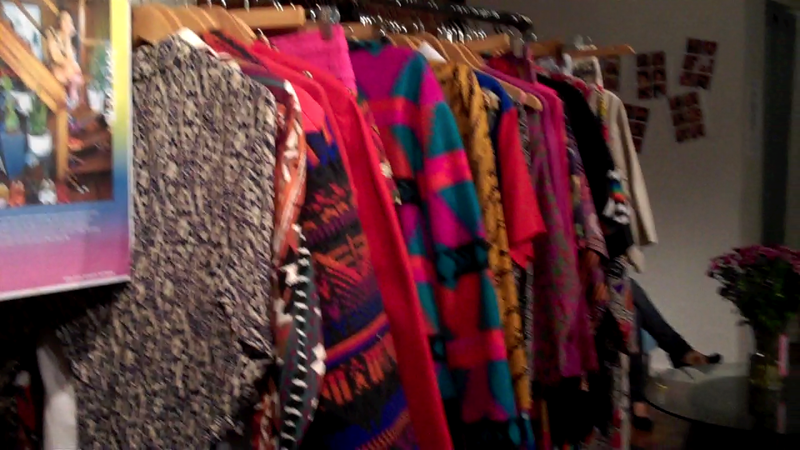 We arrived at Space 1520 to see that the happy hour was taking place within PUR, a vintage boutique. A bartender mixed St. Germaine cocktails with a California Brut, and a DJ spun mashups while tipsy hipsters shopped the racks of carefully curated vintage. I remarked on how very LA the clothing choices were, with lots of bright, Southwestern desert patterns, and Joseph mused on how very different the vibe of such an boutique would be if it were in San Francisco or New York. LA has a strong personality, and we like it. After we’d over-indulged in St. Germaine, we walked around the corner to Fuku Burger. We’ve enjoyed the gourmet burger revival taking place in LA in recent years, and were excited to try another outpost. I ordered the Tamago Egg Burger, and devoured its Asian flavors in minutes. It is now, greasy hands-down, my favorite burger in LA. 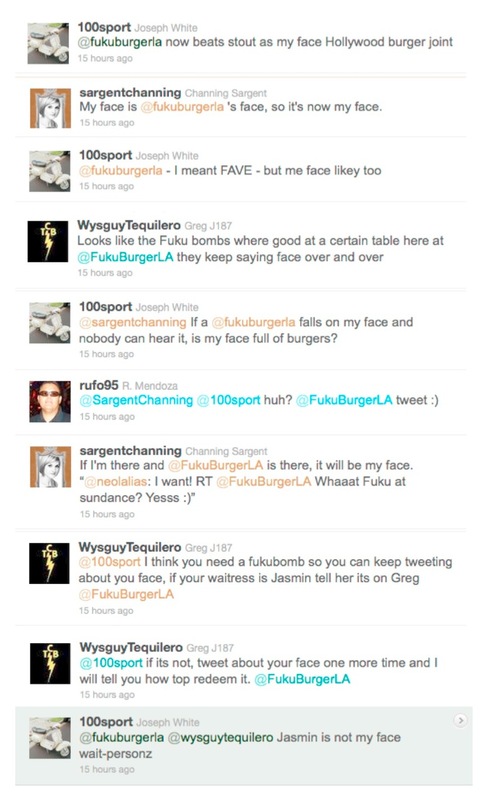 From our table behind the bar, we had a straight-on view of the large television on the wall, which features a live feed of @fukuburgerla tweets. Joseph tweeted something about Fuku Burger being his new fave, but autocorrect changed the v to a c, making Fuku Burger his “new face”. I tweeted a response, which prompted a surprising and hilarious exchange with some other folks in the restaurant, and we found ourselves crying from laughter over the whole thing. As we wiped the tears from our faces, our server informed us that two men at the bar wanted us to join them for a couple of FukuBombs – a shot of sake dropped into a glass of Sapporo. The guys were great – funny and friendly, and we felt like tourists being treated by welcoming locals. 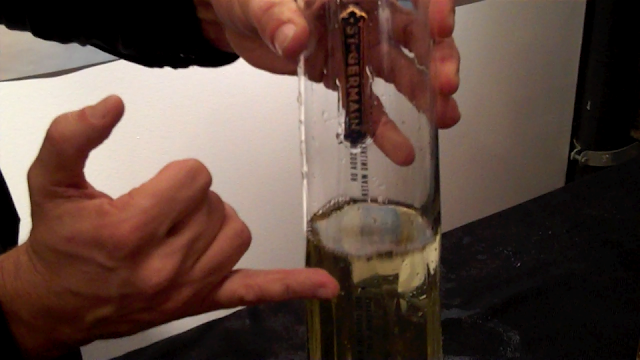 The whole restaurant cheered as we guzzled our bombs. It was a wonderful, very Hollywood night of walking, shopping, cajoling with strangers, and of course, drinking. I’m amazed I didn’t wake up with a hangover. What a fun evening!! I like to picture the entire restaurant cheering on your FukuBomb guzzling. I am going to need to work on this Tweet business before I come invade your magical city!